Xenin, a gastrointestinal peptide, regulates feeding independent of the melanocortin signaling pathway. Objective: Xenin, a 25-amino acid peptide, was initially isolated from human gastric mucosa. Plasma levels of xenin rise after a meal in humans and administration of xenin inhibits feeding in rats and chicks. However, little is known about the mechanism by which xenin regulates food intake. Signaling pathways including leptin and melanocortins play a pivotal role in the regulation of energy balance. Therefore, we addressed the hypothesis that xenin functions as a satiety factor by acting through the melanocortin system or by interacting with leptin. Research Design and Methods: The effect of intracerebroventricular (i.c.v.) and intraperitoneal (i.p.) administration of xenin on food intake was examined in wild-type, agouti, and ob/ob mice. The effect of i.c.v. injection of SHU9119, a melanocortin receptor antagonist, on xenin-induced anorexia was also examined in wild-type mice. To determine if the hypothalamus mediates the anorectic effect of xenin, we examined the effect of i.p. xenin on hypothalamic Fos expression. Results: Both i.c.v. and i.p. administration of xenin inhibited fasting-induced hyperphagia in wild-type mice in a dose-dependent manner. The i.p. injection of xenin also reduced nocturnal intake in ad libitum fed wild-type mice. The i.p. injection of xenin increased Fos-immunoreactivity in hypothalamic nuclei, including the paraventricular nucleus (PVH) and the arcuate nucleus (ARC). Xenin reduced food intake in agouti and ob/ob mice. SHU9119 did not block xenin-induced anorexia. Conclusions: Our data suggest that xenin reduces food intake partly by acting through the hypothalamus, but via signaling pathways that are independent of those used by leptin or melanocortins. This study was conducted to determine the effects of xenin on appetite related processes in chicks. Chicks were centrally and peripherally administered xenin, and feed and water intake were quantified. Chicks responded with a linear dose-dependent decrease in feed intake to central xenin and had a quadratic type response to peripheral administration. Water intake was not affected by treatment. To determine if the lateral hypothalamus (LH) or ventromedial hypothalamus (VMH) was involved in this effect, chicks were both centrally and peripherally injected with xenin and an immunocytochemistry assay for c-Fos was conducted. Central and peripheral xenin caused increased activation of the VMH but had no effect on the LH. Finally, to determine if gastrointestinal transit rate was affected, chicks received central xenin and were gavaged with chicken feed slurry containing a visible marker. Chicks exhibited a quadratic dose-dependent response to transit rate after central xenin. These results suggest that xenin affects feeding and gastrointestinal motility through hypothalamic interactions in chicks. 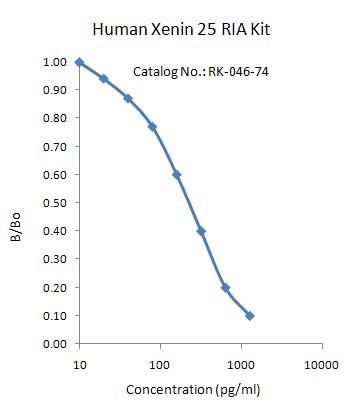 Xenin is a 25-amino acid peptide of the neurotensin/xenopsin family identified in gastric mucosa as well as in a number of tissues, including the pancreas of various mammals. In healthy subjects, plasma xenin immunoreactivity increases after meals. Infusion of the synthetic peptide in dogs evokes a rise in plasma insulin and glucagon levels and stimulates exocrine pancreatic secretion. The latter effect has also been demonstrated for xenin-8, the C-terminal octapeptide of xenin. We have investigated the effect of xenin-8 on insulin, glucagon and somatostatin secretion in the perfused rat pancreas. Xenin-8 stimulated basal insulin secretion and potentiated the insulin response to glucose in a dose-dependent manner (EC(50)=0.16 nM; R(2)=0.9955). Arginine-induced insulin release was also augmented by xenin-8 (by 40%; p<0.05). Xenin-8 potentiated the glucagon responses to both arginine (by 60%; p<0.05) and carbachol (by 50%; p<0.05) and counteracted the inhibition of glucagon release induced by increasing the glucose concentration. No effect of xenin-8 on somatostatin output was observed. Our observations indicate that the reported increases in plasma insulin and glucagon levels induced by xenin represent a direct influence of this peptide on the pancreatic B and A cells. Xenin-25 potentiates GIP action via a novel cholinergic relay mechanism (MRK-046-74). The intestinal peptides GLP-1 and GIP potentiate glucose-mediated insulin release. Agents that increase GLP-1 action are effective therapies in type 2 diabetes mellitus (T2DM). However, GIP action is blunted in T2DM and GIP-based therapies have not been developed. Thus, it is important to increase our understanding of the mechanisms of GIP action. We developed mice lacking GIP-producing K cells. Like humans with T2DM, ''GIP/DT'' animals exhibited a normal insulin secretory response to exogenous GLP-1 but a blunted response to GIP. Pharmacologic doses of xenin-25, another peptide produced by K cells, restored the GIP-mediated insulin secretory response and reduced hyperglycemia in GIP/DT mice. Xenin-25 alone had no effect. Studies with islets, insulin-producing cell lines, and perfused pancreata indicated xenin-25 does not enhance GIP-mediated insulin release by acting directly on the beta-cell. The in vivo effects of xenin-25 to potentiate insulin release were inhibited by atropine sulfate and atropine methyl bromide but not by hexamethonium. Consistent with this, carbachol potentiated GIP-mediated insulin release from in situ perfused pancreata of GIP/DT mice. In vivo, xenin-25 did not activate c-fos expression in the hindbrain or paraventricular nucleus of the hypothalamus indicating that CNS activation is not required. These data suggest that xenin-25 potentiates GIP-mediated insulin release by activating non-ganglionic cholinergic neurons that innervate the islets- presumably part of an enteric-neuronal-pancreatic pathway. Xenin-25, or molecules that increase acetylcholine receptor signaling in beta-cells, may represent a novel approach to overcome GIP resistance and therefore treat humans with T2DM. Protocol Special Protocol (200uL sample) - Please email support@phoenixpeptide.com for protocol.